Pan haggerty is a traditional Northumbrian vegetarian dish containing potato, onion and cheese. 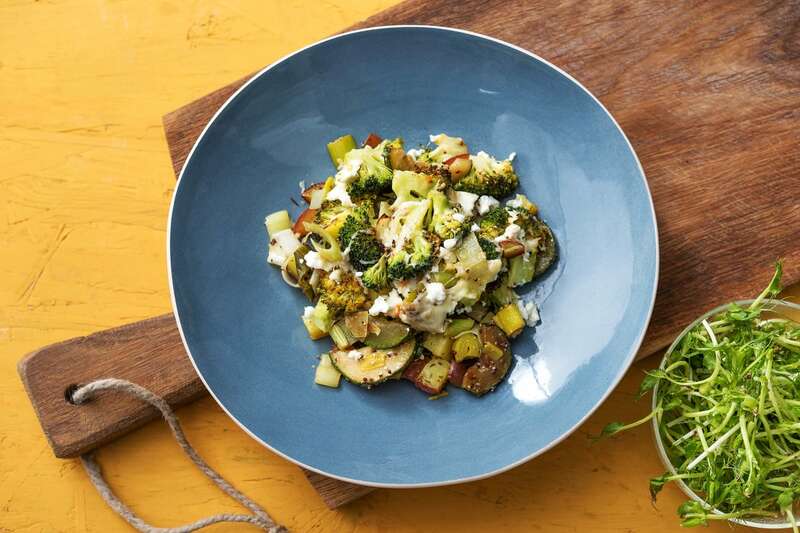 We've pimped it up with the addition of broccoli, leek, courgette and delicate pea shoots. This dish will warm you from the inside and pack in plenty of extra veggies! Preheat your oven to 200 degrees. 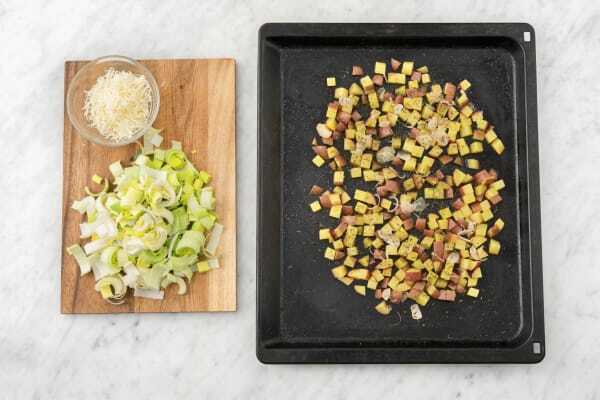 Chop the red potatoes into 1cm chunks (no need to peel) and pop onto a baking tray. Cut the shallot in half through the root. Peel and then slice into thin half moon shapes and add to your potato. Drizzle with oil, a good pinch of salt and the dried thyme. Toss and then roast on the top shelf of your oven for 25-30 mins. Turn halfway through to make sure they cook and brown evenly. 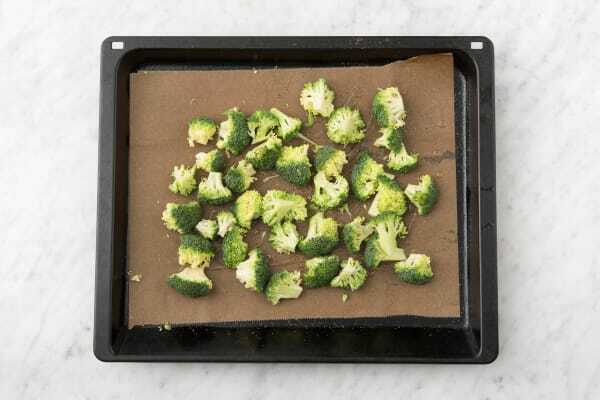 Cut the broccoli into florets (small trees) and put these on another baking tray and drizzle over some oil, a pinch of salt and a good grind of black pepper. Pop on the middle shelf of your oven and roast for 12-15 mins or until charred and crispy at the edges. When ready, remove from your oven and keep to one side (it will go under your grill later). Meanwhile, remove the root and green part from the leek. Cut in half lengthways and then slice into 1cm thick half shapes. Grate the cheddar cheese. Next, remove the top and bottom from the courgette. Cut in half lengthways and then chop into ½cm thick slices. Place a frying pan on high heat (no oil). 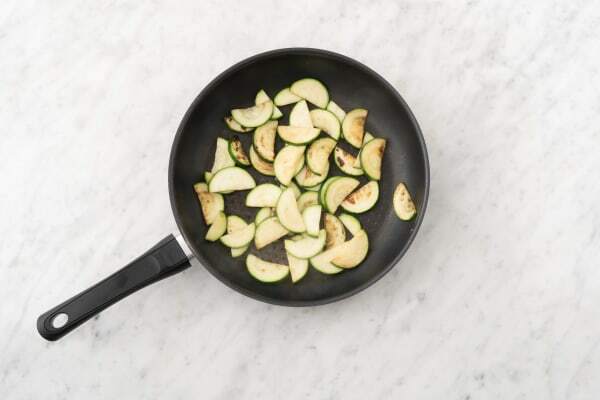 When the pan is hot, add your courgette and cook for 5-7 mins. Stir every now and then. 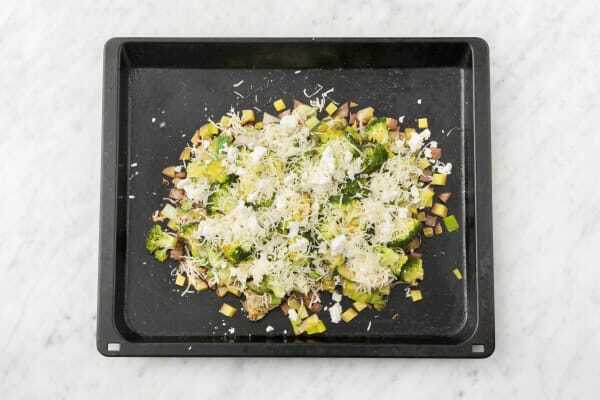 Tip: You want the courgette to brown but not burn. Add a splash of oil to the pan and then add your leek. Cook for 3-5 mins or until soft. Remove from the heat and stir in half the wholegrain mustard. It's now time to assemble your pan haggerty! When your potatoes and broccoli are cooked, remove from your oven and turn your grill to high. Top your potato with your leek and courgette. Next, add a layer of your broccoli and then crumble over the feta cheese. Finally, sprinkle on your cheddar cheese and pop it under your grill for 3 mins or until your cheese is golden and bubbling. Whilst your pan haggerty is under your grill, mix the leftover wholegrain mustard with the olive oil (amount specified in the ingredient list) and toss this through the pea shoots. Spoon your pan haggerty onto plates and serve your pea shoots on the side. Enjoy!